As she prompts us with a type of fruit. And I drink orange juice as my eggs I fryant. Kiwi is cute don't you think? They all make you regular, they really do. Although like a certain fruit it holds a lot of appeal. See I like bananas. I like them a bunch. Sometimes in a peanut butter sandwich, I'll have one for lunch. I wonder who ever came up with such a silly prompt as "the awkwardness of the common banana"! Okay, now that we got through that, two things: 1) head on over to We Work For Cheese to check out the links and see how other bloggers dealt with this prompt; and, 2) check out dufus daze for this week's Sunday Funnies. Did you know I dated Carlos Santana in high school? 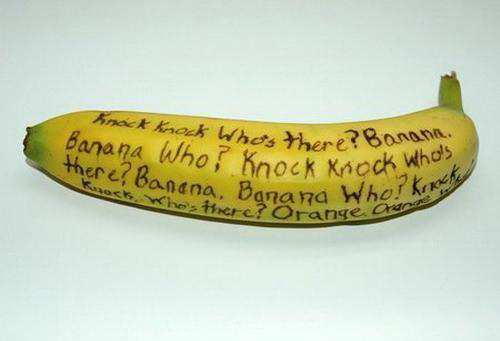 I never thought of Santana rhyming with Banana, but it certainly does! You missed your calling! You are a great poet. Move over Byron. Aren't you just a man of many talents? Being a poet among them. "...as my eggs I fryant." Oh, you are such a delightful nut Dufus. Happy Father's Day! Yes, Kiwi is cute. LOL! I once went to Memphis on a business trip. I'm not an Elvis pilgrim, but one day, we went to eat at one of the many Elvis eating emporiums. I ordered a peanut butter and banana sandwich, one of Elvis' favorite meals. I think I know what killed him. The first and only poem I've ever read about a banana. That should be inscribed on the walls of the National Banana Museum. There is one, isn't there? Love it! Didn't see your post over at WWFC, so I came snooping and see that it's here. Well done! You've quickly become one of my "have to read daily" blogs! Oh, snap! Great poem, Dufus! Very funny! Wow, P.J., you're too kind. I'm glad to have you drop by. Well if there isn't there sure should be. It would sure appeal to me. Maybe I should expand and write about more fruit. I mean at the very core I could start with apple. Yeah, he deep fried those things. I know what killed him too. Well what else would rhyme with Bryant. As my dishes are dryant? Holy crap, no kidding. You've got to tell me more! Like what was he like? Was he into music back then? Stuff like that. Super nice guy. Into music with his brothers when I knew him. We were both seniors in h.s. At first I thought you did a "twisted tune" to some known song (like your "My Pneumonia") and where you apologize to the original artist of the song. Nope, no inspiration from elsewhere. I came up with that all by myself!